Benefit Kids and Adults with Disabilities. What if the coffee you drank changed the lives of people with disabilities? What if that coffee was an award-winning roast? At Aspire CoffeeWorks, adults with and without disabilities work side by side to bring you freshly roasted coffee. It’s a productive and successful environment and a great example of how people of all abilities can work and succeed together. 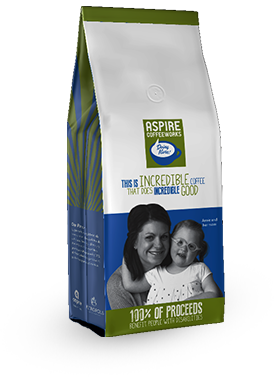 Be a part of the award-winning, life-changing coffee where 100% of net proceeds go to programs and services for kids and adults with disabilities! Buy a bag, enjoy it, share it and spread the word. Much of Brooke’s therapy has focused on muscle development and strength. “She’s had to learn how to use different muscles to compensate for weak areas,” explained her mother, Angela. Aspire CoffeeWorks couldn’t do what we do without amazing partner’s like Metropolis and Canteen, but they aren’t the only partners helping us Do More. We will keep you up to date with the latest coffee news, promotional offerings and stories about how you are helping us make a difference.